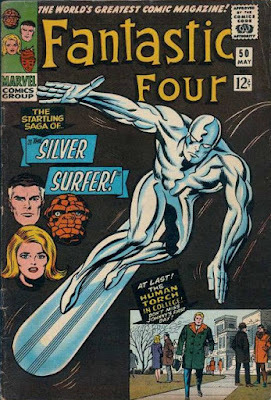 It is likely that Stan Lee suggested that Kirby expand the Silver Surfer from a very minor bit-player in Fantastic Four # 48 to a major supporting role in # 49 and #50. Several of the subsequent stories that feature the now earthbound Surfer – particularly the one where Doctor Doom usurps his cosmic powers – look as if they were Stan's ideas. Jack Kirby was well aware of the religious resonances of the character. 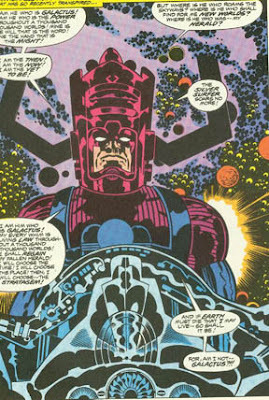 When Galactus exiles the Surfer to earth, we are supposed to think of God casting his favoured angel out of heaven. (This is particularly pronounced in the 1978 graphic novel version of the story, in which the Surfer spends a full page plummeting to earth.) Of course, 'God' is here the baddy, and 'Lucifer' is the goody, but Kirby revelled in reversals of this kind. In case you miss the point Stan makes the Surfer's main adversary a demonic figure called, very subtly, Mephisto, who wants to destroy the Surfer because, er, he does. Whether he’s predominantly noble or innocent, the Surfer is a kind of Platonic figure representing an absolute value. Such a character needs a human foil to spark off, just like the nobles in Shakespeare plays need the common folk. Creating Mephisto or some other cosmic opposite makes things not only somewhat predictable but also remote, disconnected from the reader. I’m a Kirby purist of the strictest school and even I acknowledge Buscema did some of his best work on the solo Surfer. Are you sure that the jewish creators of the Silver Surfer would really have been making a 'good=Jesus' connection? We should ask Mark Evanier or someone how observant a Jew Jack actually was. I know he had a Jewish funeral, but beyond that...did he keep passover, go to temple? I actually don't know. The superior Kirby version of the Surfer is an alien, very probably created out of thin air by Galactus. Possibly, like his board, he's made of energy and sometimes takes on a solid form. He[Photo] doesn't have digestive organs, so there is no reason to think that he is biologically human in any other respect. Although he is impressed by Alicia's nobility, there is never the slightest hint that he is sexually attracted to her -- he simply doesn't understand Ben's jealousy. And he goes naked. So the answer to the pressing question 'Does the Silver Surfer have a willy?' is 'Up to Fantastic Four # 70, no; after Silver Surfer #1, yes. I agree with Mr. Rilstone that the original conception of the character is superior to the Russell T, er, Stan Lee version of the character. Interesting idea. Any chance we could get you to expand on it at all? I’ve always thought of the Surfer as Kirby’s until the solo comic. Though of course Kirby was always throwing up characters faster than he was figuring out what to do with them.